Ontology of God: The voices of the ancients speak.by Dorian Scott Cole. Description. Available now on Scott's Amazon.com store. Echoing through time are the voices of ancient people telling us about God. From Mesopotamia and Egypt 5000 years ago, often from even earlier oral traditions, every civilization has been inspired to tell us about God. Their voices vary widely and even conflict. Is there a common message that they thought was so important that they had to pass it on? In this book, the ancient voices speak. This study follows the thread of the basic religious concepts of law, mercy, and love that are prominent in many religions. Major religions around the world are investigated up to the launch of the Common Era when most religions had been developed, including religions that later developed independently such as the Mayan. These are messages refined by the fire of experience through the ages. The repeated messages collectively bear the tests of validity. This study also looks at the many methods we use to try to understand God and religious literature. Is the nature of God reflected in what he asks of us? The premise is that it is. By understanding the nature of God, perhaps we can filter out the many competing voices that tell us that God stands for such things as the murder of innocents and destruction. The very nature of religion is illuminated in the light of the voices from the ages. But is ancient religion a path that we have lost, or does history hammer out newer voices to bear the truth of new experience as people try to understand their relationship with God? About the author: Dorian Scott Cole is an independent, cross-disciplinary scholar with education and experience in psychology, philosophy, religion, language, visual semiotics, and technology. Other books and publications: How to Write a Screenplay, Writers Workshop Script Doctor, www.visualwriter.com, and www.onespiritresources.com. The way that I use the word, in the context of these articles is, "an ontology states the relationship between things." While I typically just say, the "aboutness," or the "core," these words don't accurately convey the meaning. For example, I'm not writing in this series about "everything" about God. I doubt that I have the ability for even a fractional understanding of that. This series simply explores what can be learned through existing writings, specifically religious scriptures, about God's relationship with certain people. This series will present two different types of research through an "ontological construct approach to theology." One type is the intuitive presentation in which I present what I already know. Obviously this is "finding what you are looking for," and is not "scientific." To eliminate bias, some of the research will be presented as guided by an analytical strategy of literary analysis. What I expect to find, and the analytical strategy, are both presented in the next two sections. "Relation" or "relationship" is the key. If two items are related, what is that relationship? For example, if I have a collection of blue buttons, then that hidden line that relates all of them is "blue buttons". The relationship could be "relevance." Categorization is a similar principle, but categorization more commonly means that the items are alike or share an important characteristic. They don't have a relationship, just a commonness. In an ontology, I am looking for the basic nature of the relationship. Ontology is not about similarity, but about the relationship itself between items. For example, love, hate, warmth, desire for another, admiration for another, cheapness in a relationship, and opaqueness in a relationship, are characteristics for which individual ontologies might be created, or might describe a single relationship. Ontology is the unifying element for which the construct is created. A construct is just a list of characteristics that represent something. In this ontological construct about God, what I am focusing on is the relationship between God and a subgroup of people which I generalize to all of humanity. The predominant characteristic is love. I am populating the construct with characteristics that arise in the relationship. To clarify some important points, 1) I don't "define" anything on this Web site. Definitions are "closed" in that they set permanent boundaries. I'm not all-knowing about any subject, so I don't set boundaries, or prevent ideas from growing. I simply "describe" what I find. Descriptions are open systems that can grow and continue growing. 2) I am a person of faith (Christian), and my interpretive perspective is from a position of faith. I have no real position on history, and don't consider historical accuracy to be a basis for faith. 3) I don't judge the validity of other faiths, and favor pluralism. 1. The predominant characteristic in the relationship is love. While "affection" may be a component in this love, affection is not the predominant characteristic of this love. It has often been described as "charity," and is defined in the Merriam-Webster dictionary as: 4 a : unselfish loyal and benevolent concern for the good of another: as (1) : the fatherly concern of God for humankind (2) : brotherly concern for others. Merriam-Webster Online Dictionary copyright © 2004 by Merriam-Webster, Incorporated. Regarding love, love from God is not something that is turned on and off, or can be broken. Love doesn't depend on circumstances, who you are, what you have done, ethnicity, or national origin. Love isn't dependent on our behavior. Love isn't withdrawn when things aren't going right, or when it isn't reciprocated. Love isn't something that is deserved. Love from God is permanent. Love determines all of God's actions toward us, both as individuals and as humanity. 2. People misbehave and are disobedient, in that they turn away from instruction from God, they hurt themselves, and they hurt each other. People are not "evil" in these actions, and they aren't born into some kind of "sinful" condition that condemns them at birth, puberty, or the "age of responsibility." Normally our actions are our way of growth (experiential), and we are responsible for our actions and for the consequences. Neither are sexual feelings inappropriate or condemning, but we are responsible for our sexual behavior. Our actions create a separation between us and God. This doesn't separate us from God's love any more than 100 miles separates from the love of another person. But 100 miles does separate us from a loved one, just as our actions separate us from God. Law is a basic standard of human conduct for the preservation of humanity. Human intervention is required when people break the law. The law establishes order so that society can function. It is not a list, but a spirit of order and justice. Obeying the law, whether civil or religious, does not make us of good character. It prevents us from being of bad character. Religion, or even humanitarianism, can help us improve our character - but it is our choice. Our "bad" actions, especially if they continue, can bring damage to us psychologically, and bring suffering on ourselves. The only thing that can condemn us is if we reject God entirely. The Adam and Eve story tells us about separation from God. The actions of King David (adultery, murder) illustrate the forgiveness of serious (and all) offences. The prophets tell us about God reaching out to those who have strayed away, and about the power of turning away from our offending ways (repenting) and back to God's ways. Christ reflects all of these things, and tells us about God coming after those who have separated from his ways, about repentance, and about forgiveness. 3. Reconciliation. God loves to forgive, and wants the relationship between us and him healed, no matter what we have done. The path to forgiveness is to ask for it, and agree to try not to turn away again. We are to forgive 70 times 7 times, or in other words continuing. We expect the same from God. The term that best describes the relationship between humanity and God is "parent." Christ called God, "Father" (Abba). Titles like "Lord," which are commonly seen in the Bible and other places, imply a different relationship, like servitude and lack of free will, which doesn't characterize the relationship well in today's vernacular. Our relationship with God begins with profound awe and respect for one who created us and can destroy us, but loves us without qualifications, and is immensely tolerant. Our destiny is in our hands. To put the relationship in terms that we can understand, the terms would be father, confessor, leader, provider, compassionate friend - or in some cases, the person with the hammer. Growth. We learn by error. Errors, or our offences, are growth pains. Unlike the Adam and Eve allegory, our errors don't create a permanent separation from God, but are more like the misbehavior of children. Typically we experience the consequences of our actions, and we experience what comes with life. Evil. Evil is not the mistreatment of others that we all are guilty of. Evil is the willingness to hurt other people, or God, out of disinterest or selfish pursuit. Evil is psychopathic: unfeeling and uncaring. If evil loves, it is a self-serving use of other people. The antithesis of this is what we are supposed to become: people who do care about others and who love unselfishly. It is a path full of obstacles that make us grow. 4. God is the God of all people, not a select few. It is not within God to be caring toward a few and uncaring to the rest. 5. A mystery: We are interconnected, which is demonstrated by the power of prayer for others, which has been scientifically studied and confirmed. This perhaps also lends some support to the Roman Catholic notion that our prayers can assist those who have passed away - the idea of Purgatory. This interconnectedness of people is hinted at by the emphasis on not mistreating others, caring about others, and praying for others. Reconciling with others is of primary importance in our relationship with God, displacing prayer until it is done. Interpretation of Biblical literature is highly dependent on context, as covered in the several articles previously written in this series. Context includes, 1) the perspectives of prevalent cultures in the Middle East; 2) the framework that the idea fits into (in this case some portion of religious Law following some type of condemnation); 3) the words themselves; 4) the other words used in the passage that create meaning; 5) actions used in the passage that create meaning; 6) the purpose of the words, following from the situation(s) being addressed; 7) the perspectives of the religious communities through history on this and other similar "offences;" 8) attitudes of the community toward its own beliefs and actions, and regarding the past; 9) the consistency of the Scriptures; 10) understanding the passage through the example given by Christ; 11) often deeper (and often more personal) meanings are seen in the text as people mature; and 12) the future direction that the religious community decides to take. These types of context are delineated further in various places in this article. How people view the interpretation of Scripture is one of the contexts that determines how things are interpreted. Views inherent in community and in views of the past are very important. In looking at interpretation, one thing to consider is from whose point of view is the story being told. In an article on the Gods of Ancient Israel, I listed the points of view of different books, including creation stories, the state, the prophets, and the people. Speculation on the cause of writing, or on other meanings, is not a very convincing approach unless it can be convincingly demonstrated that the writer clearly had other motives. In other words, speculation that a text fits into some other social, historical, or motivational context doesn't mean that it actually does. The simplest explanation is probably the correct one. There is no ideal speaker or ideal hearer possible for the text due to the evolution of words over the centuries, the lack of a definition of words in ancient times, the many translations into various languages, the evolution of ideas through the centuries, major cultural differences, and unknowable context in historical times. An example of speaker/hearer difficulty is seen in what I believe is the evolution of the idea of destruction of wicked individuals and civilizations, which grew into the "Day of the Lord" motif and a day of judgment, it flowered in the prophetic tradition of prophesying doom on cities and Israel's enemies, and finally became the apocalyptic literature. Christ used similar apocalyptic concepts and rich visual images of fearful endings. These ideas later morphed into ideas of hell as an actual place of punishment, and then the Roman Catholic Church seems to have borrowed the idea of "Purgatory" from another religion. People like Dante, let their imaginations run free, creating more rich visual images of this place called Hell. What we have today is a fully blossomed tradition of judgment and punishment of wickedness, which is far different from what the ancients thought or Christ intended. It is built mostly on speculation and engenders fear, which is a method of control that is representative of the brutality of the Middle Ages. When today's notions are deconstructed, it leads back to a couple of basic ideas about the destruction of those who ultimately refuse the way of God in their lives or who become evil. There were multiple ideas in ancient times of what came after death, the Bible contains few of them, and what the ancient people meant when they said certain things is not what we mean today. This is the subject of a later article in the religion series. From the point of view of historical (era) analysis, each era represented in the literature can't be evaluated independently from other eras. Each era is dependent on previous eras, and many books appear to have been either rewritten or added to in one or more additional eras. This should be self-evident since the Bible is not a single book, but a compilation of books that were written over at least 8 centuries, and some oral histories weren't written until centuries after the events. Regarding the integrity of the literature (accuracy, and veracity), who knows? I pretty much take it as it is, considering to be of primary importance the message that someone thought important enough to record as their inspired interpretation of events. But I believe that it is there as an example, and we are the interpret its importance today. 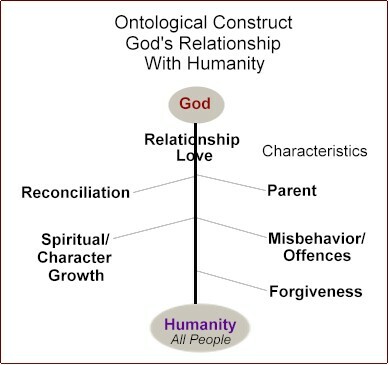 The goal is to create an ontological construct of the characteristics of God's relationship with humanity, specifically with a small group of people in a limited historical period. In 1979 someone said to me that Christ spoke about Hell as often as he spoke about love. I did a quick survey of one of the four synoptic gospels and found that although "love" was more prominently mentioned, Hell was very frequently mentioned also. I found this odd for a text that supposedly features the idea of love. The reason why is because Christ spoke primarily to the Jews, and the focus of his talk to them is about the logical outcome of depending on "The Law" for your future. No one can ever live up to all of the terms of the law - no one is that perfect - so the law only condemns you. Love is the alternative that he offers them, and love is more often mentioned when he changes his focus and speaks to those who are not Jews. This points to one of the difficulties in analyzing literature, specifically the Bible. Simple things like "word frequency" counts fail to categorize themes because different themes are targeted to different audiences. An example of this problem is the President's State Of The Union Address in 2004. The President intended foreign countries to hear certain messages, he intended Democratic Congressmen to hear certain messages, Republican Congressmen to hear certain messages, All Congressmen to hear certain messages, industry leaders to hear certain messages, government leaders to hear certain messages, segments of the population (retired, those without healthcare, Hispanics) to hear certain messages, and the American people to hear certain messages. So without indicating in any way that this was his intent, he was talking to a number of different people about a number of different themes and topics. To analyze his entire speech would be a very complex task. Word frequency counts are compounded by the fact that concepts may be represented by many different words. For example, the concept of Hell, today would have several words lumped into the category. "Outer darkness, the lake of fire, gehena, and sheol, today are simply considered synonymous with the concept of hell. This requires deconstruction of today's common vernacular to determine what the actual concept is, and then requires searches on possibly several different words. Concepts presented in the Christian New Testament don't have uniform opposing concepts. For example, love is the key motivating concept in the New Testament. The opposite of love is "hate," as in "love the one and hate the other." But hate is not found very frequently. Instead, what we find is that the word love is the translation of several words, many of which would not count in a word frequency count to represent a topic. Love is the word that Christ also used to describe his feelings for his associates, and for brothers. It could also mean sexual desire, etc. To make the matter even more complicated, the original words of Christ were probably spoken in Aramaic, translated to Greek during the next 100 to 200 years, and then translated to English about a thousand years later. Greek words took on different meanings over periods of centuries, and in different geographical areas, just as we can hardly recognize the English of even 400 years ago. The complexity of the literature doesn't lend itself to easy numerical analysis. The topical approach to analysis, which I highly prefer, is also problematic. Should all passages be considered that relate to the topic? How will they be found, and how relevant should they be? Some concepts are referenced without even using a representative keyword. This would be the classification project of a lifetime, and it would be followed by a consideration of each passage, in an extensive context - another very long project. Memory is one device for locating relevant passages of text, however, I have the memory of a steel seive. Choosing passages that represent certain concepts is one valid tool of study, but it brings an obvious bias: selectivity. Random sampling of passages of text or representative books is another method of analysis, but which passages and books are really representative of the entire Bible? Probably none - they are all written for a purpose. On the one hand, the Bible is subject to the interpretation of religious institutions. On the other hand, it is subject to personal interpretation and faith. It resists modern methods of analysis, and even systematic theologies vary. Rather than force a single methodolgy onto the literature, the methodology I have selected is simply eclectic.